Adding a quilt binding is the last step for your quilt. The fabric is cut on the bias and in a continuous piece of bias binding. 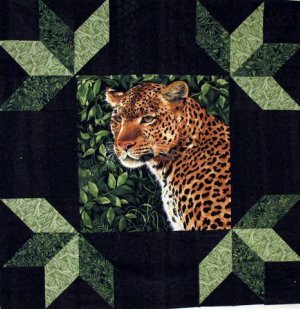 You have pieced your quilt, added the right batting to a squared backing and quilted it using a technique to complement your design. Skillful edge finishes will complement the quilt top. The final stitching will influence whether your edges lay flat or whether they ripple. The choices you make in the fabric color as well as the design of fabric will also influence the final look. Binding a quilt is just as important, if not the most important, step in making a quilt. 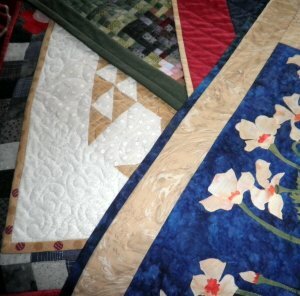 Okay, I'll admit it, all the steps are important for me...I'm just a quilting junkie! 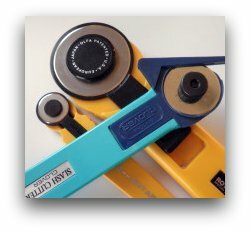 to Cut My Quilt Binding? 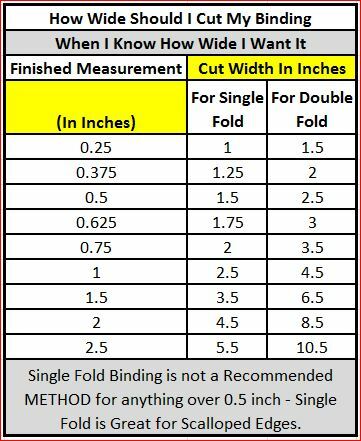 The width of your quilt binding will be influenced by whether you use a double fold or a single fold binding. If you have a strong preference this needs to be decided before you cut the quilt binding strips. 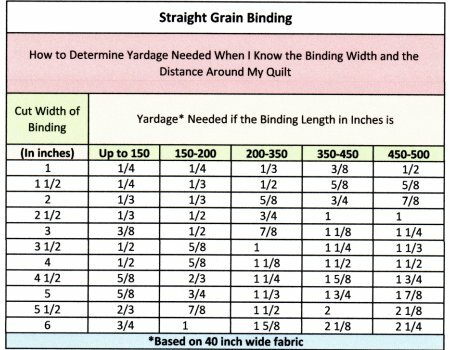 This chart will take the mystery out of what width to cut your quilt binding. These steps on how to make a quilt are easy. Feel free to print this page and keep the free quilting instructions for your use. Or better yet, put this in your favorites and come back often. 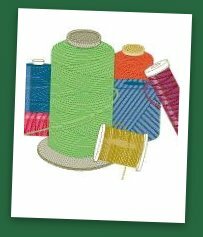 Look around and you will find many, many free quilting instructions on this site! 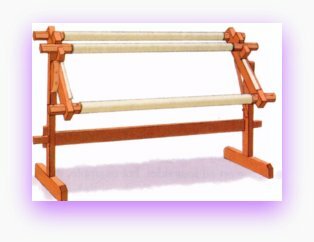 Be sure and visit our Machine Quilting Patterns and Continuous Line Quilting Patterns for ideas on quilting quilts. The width of the binding is typically 1/4-inch when finished. But remember this is art quilting and it should be fun. It is your quilt and its your final opportunity to make a statement, so there are no wrong choices. For me I have better luck when using a 1/2-inch binding. Once the binding has been turned you lose 1/8 inch in the turn. The 1/2-inch choice puts you at a strong 1/4 or a weak 1/2-inch after you blind stitch the quilt binding in place. Skewed fabric will need to be straighten before you cut your binding strips. Being skewed is most visible with Plaids and stripes. As long as the design is not off more than two or three inches you can try to straighten the piece by placing a small cut at the selvage. Next grasp the edge on both sides of the small cut and tear straight across. Your tear will follow along the crosswise grain and square up the edge. Do this at both ends of the fabric. Grasp opposite sides of the torn fabric at a 45 degree angle to the torn edge and give a strong tug. You will need a helper for this process. Do this all the way up the selvage edge until you have moved the full length of the piece of fabric. When finished, your torn ends should be square. Fabrics are not always printed exactly on grain. In this case it may be necessary to cut along the pattern in the fabric instead of the grain. When using geometrics or other prints for binding a quilt, it is important to cut along the design lines otherwise your binding edges of the quilt will look crooked. First Way: When binding a quilt it is easier if there is a little bit of stretch when applying the quilt binding. 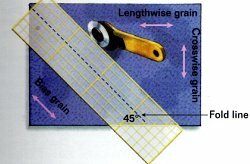 Since the lengthwise grain has little or no stretch this method of cutting would not allow you to do any 'easing in' when applying the binding to the border. Because a single thread runs the entire length of a piece of fabric (along the selvage) when the edge is turned or folded, that thread will be vulnerable to wear and tear. 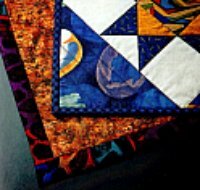 Because a baby quilt is washed, hugged and twisted a lot, it most likely would not be an ideal choice for binding a baby quilt. On the other hand, wall hangings would be fine. Cutting lengthwise strips require the greatest amount of yardage and are not necessarily an economical use of fabric. But it is a great way to minimize joining seams for binding a quilt. You can use the lengthwise grain to achieve a definite effect if your fabric has a specific design like a stripe or a border print that you want to appear in a straight line. Second Way: When binding a quilt you can cut the strips on the crosswise grain (selvage to selvage). This way has a little stretch and therefore allows the fabric to lay flat. Cutting selvage to selvage will require a little more piecing to get the distance needed to travel around the outer perimeter when applying your binding. But still, it is an excellent way to cut the binding. This is the most economical and provides the most strips for a small amount of yardage. Third Way: When Binding a Quilt is cutting on the bias which is the best method if your quilt edge is scallop, serpentine or has round corners. You would also use this method when you want a stripe to appear to spiral, or plaid binding to be on the diagonal. Continuous bias cut 1 1/4-inch wide is perfect for most curved stems and applique vines. With a double fold binding you will fold the binding strip lengthwise with wrong sides together. Press using an up and down motion making sure you do not stretch the binding by pulling the iron back and forth over the fabric. Also don't let a long length of binding hang over the edge of your ironing board as the weight will stretch it. Place the folded binding strip on the quilt top and align the raw edges. Do not trim backing or batting before applying binding. Trim them after the binding is applied. Secure binding with small pins about 18 inches in front of the sewing machine needle; sew; and then secure another 18 inches with pins. Continue this process until all binding has been sewed to the quilt top. Sew the binding to the quilt with a 1/4-inch seam allowance using a walking foot. Again, remove the pins as you approach them. Do not stitch over the top of any pin. See Binding a Quilt for how to handle the corners, as well as, how to handle the beginning and ending tails of the bias strip. After you finish sewing the binding to the quilt top, trim the batting and backing even with the straight quilt edge provided you decided to use a 1/2-inch finished binding. If you decided to use a binding wider than 1/2-inch you would trim the batting and backing wider than the straight quilt edge. 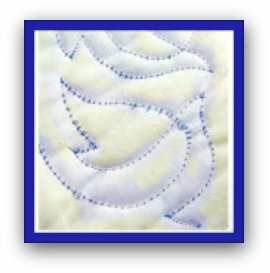 It is important to completely fill the binding area with batting and backing to achieve a crisp, full finished edge on your quilt. I learned this technique the hard way. The judges at the quilt show, where I entered a quilt, pinched my binding and found that I failed to make sure the area was filled with batting and backing to achieve a crisp, full finished edge on my quilt. Use a Blind Stitch to secure the binding. Fold the binding over the layered quilt edge to the quilt back. 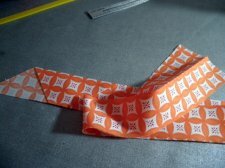 The fold of the binding should just cover the 1/4-inch seam allowance made by sewing on the binding. Use matching thread to blind stitch the fold of the binding to the backing. Only pick up a couple of threads of the backing fabric exactly underneath the edge of the binding, and then slide your needle into the fold in the binding. Bring your needle back out of the fold about 1/8-inch away from where you entered. It is important to use small stitches for securing the binding for a more durable finish. If you can slide your finger nail between stitches then the stitches are too far apart. Continue using the blind stitch all the way around the quilt to secure the binding. You can't go wrong when using our steps on how to bind a quilt to make your quilt ready for show and tell! Single fold binding reduces corner bulk when working with butted borders. 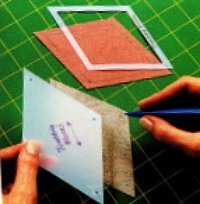 It is also best for scalloped or curved edges especially if the binding is cut on the bias. 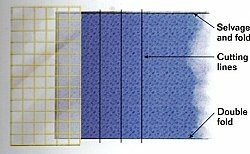 When working with miniature quilts, wall hangings and uneven lines, single fold binding is appropriate. You will have a delicate finished appearance with less bulk on smaller quilt bindings. Place the right side of your binding on the ironing board with the wrong side facing up. 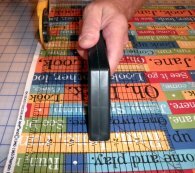 Turn under 1/4-inch and lightly press along the entire binding strip. This crease will assist you in turning under the edge more easily during the final step of binding a quilt. Use an up and down motion with your iron. Dragging the iron back and forth will stretch the binding out of shape. Place the binding strip to two opposite sides of the quilt top, right sides together. Align the unfolded edge of the binding with the straight quilt edge and secure with small pins. Using a walking foot sew the binding to the quilt with a 1/4-inch seam allowance removing the pins as you advance. 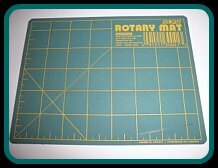 Using your ruler and rotary cutter, trim the batting and backing to the desired width after you have finished sewing the binding to the two opposite sides of the quilt. 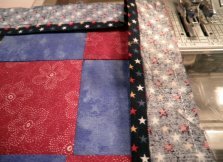 Once you have the binding sewn to the quilt top you will fold the binding over the layered quilt edge to the quilt back. It will be a snug fit and should cover your 1/4-inch seam line. After turning the bindings to the back, blind stitch using matching color thread. The pressed 1/4-inch fold should lie nicely and provide a finished edge on the back side of the quilt. After it is blind stitched, trim the ends of the binding exactly even with the two remaining unbound side of the quilt. Now sew the binding to the other two sides, leaving a half inch of extra binding at each corner. Trim the batting and backing and then fold the extra 1/2-inch binding in so that it is even with the previously bound sides of the quilt. With the folds in place, turn the binding to the back of the quilt and blind stitch the last two edges using matching thread. 9-Patch with applique bunnies...Have fun with our puzzle!